Update for Stroud Against the Cuts Supporters April 2015: Austerity Hustings video, NHS play, Workfare Week of Action + more! Please find below some updates including upcoming events and interesting articles. Thanks to Stroud Community TV we can bring you several clips from our Austerity Election debate: How to oppose Austerity, responses to a question about how people can survive when benefits are being cut, candidates sum up, and also answers to a question on climate change. You may also be interested in watching the film screened at our NHS meeting about the campaign to Keep Gloucestershire community health services public. You can read a write-up of the election debate in the Stroud News and Journal. One of the subjects that came up at our hustings has also been featured in a recent report by MPs: "Benefits cuts driving poverty-stricken people to suicide"
Aditya Chakrobortty in The Guardian has also written an article worth reading on benefit cuts "Cameron’s workers v shirkers scam has at last exposed the Tory law of benefit cuts"
It is also worth reading Simon Wren-Lewis piece in the London Review of Books: "The Austerity Con"
Disabled People Against Cuts have written an Open Letter to the Labour Front Bench on the Independent Living Fund. The loss of ILF doesn’t just affect ILF users-it affects everyone - watch a film about the ILF here. Aaron Bastani writes "The Tories Won't Admit It, But They're Planning More Cuts for the Young"
Since our election debate, others have taken place. You can also watch clips from the MyStroud MP debates (featuring representatives and candidates from all the parties) on Stroud Community TV: National Question Time with each of the candidates (1hour), Local issues debate - with a Lib dem representative and all the other candidates save Caroline Stephens of UKIP (70 minutes), and 40 minutes of the International issues debate. Local members of the Socialist Party have circulated a documentary about the making of their election video - they are standing a parliamentary candidate in Gloucester and District Council candidates in Stroud but are not featured in several of the debates above. Next week the Cotswold Playhouse on Parliament St is host to a Hexagon Theatre production of "This May Hurt A Bit" - a play about the NHS that has been well-received when performed elsewhere in the county previously. The play is on Thursday 23rd - Saturday 25th April, at 7.30pm each evening. Tickets (£12) are available online here, and further information is below, followed by some key articles on the NHS. "Faced with an urgent need to choose between seeking private medical treatment or sticking to long-held beliefs and trusting in the NHS, a family are at loggerheads. Will they make the right choice? Will there be regrets as well as recriminations? 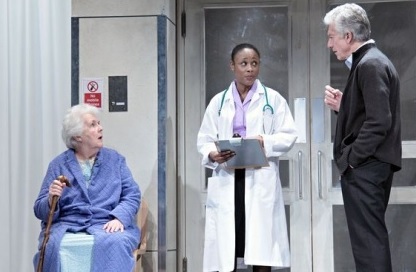 “This May Hurt A Bit” - by Stella Feehily - was described by The Observer as “Hilarious and hard-hitting - moves to tears”. This humorous and poignant play is extremely topical. It was only in 2014 that it had its national tour. Hexagon are proud and delighted to have obtained permission to perform it as soon as it became available for amateur companies. In 2015, Hexagon are celebrating 30 years of presenting entertaining and thought-provoking plays in Stroud." Meanwhile... More than 100 top doctors have attacked the Coalition government's record on the NHS. You can read an article about this and the letter via the Guardian website. Read Stroud Against the Cuts member Caroline Molloy's latest article on the NHS - which deals with the £8bn figure you'll have no doubt been hearing so much about during the election campaign ("a zombie figure that won't save the NHS"). The Greens have become the first political party to promise to boost the proportion of NHS funding for primary care to 11%, as demanded by the RCGP and GPC. And there is some confusion over the Conservative manifesto. 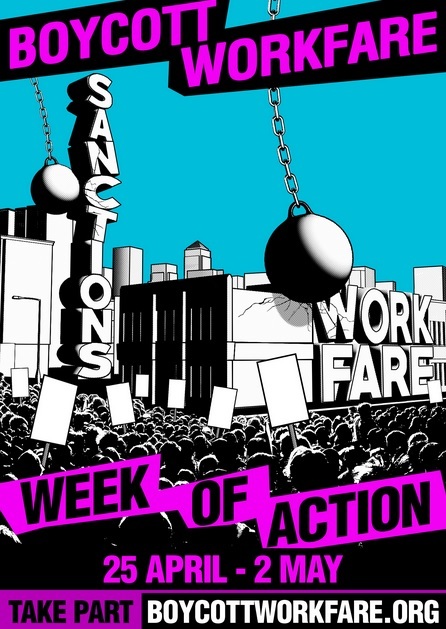 Boycott Workfare week of action, 25th April - 2nd May. They say: "No workfare. No sanctions. Whoever wins we will resist! Join in with online actions throughout the week! Ask charities you support to sign the Keep Volunteering Voluntary agreement! Speak out! Tell those promoting workfare and sanctions what you think of their policies! Hand out our know-your-rights leaflets at your local jobcentre! Plan actions at a workfare exploiter near you! Boycott Workfare have also organised a Welfare Action Gathering on Saturday 30th May, 10.30am-5.30pm, London Welsh Centre (10 minutes’ walk from King’s Cross station). Read more at "The Fight To Save Social Security Won’t Be Over Whoever Wins The Election, Come To The Welfare Action Gathering"
Kings School, Gloucester, 30th April. Churches Together in Stroud are also hosting a hustings on Thursday April 30th from 7.30pm at St Laurence Church Hall, GL5 1AP. Local grammar schools Marling and Stroud High are planning to increase their student intake, in a move which the heads of other local schools says threatens their intakes and will lead to £3million of cuts at comprehensives. The story was covered locally, and has since been picked up in The Guardian ("‘Predatory’ grammar schools and local comprehensives in battle for survival"), and a petition has been organised. Do many of you play the Ukulele? You'll no doubt want to learn after this short video of a busker with a message for David Cameron as he staged a photo-opportunity (warning: swearing). Copyright © 2015 Stroud Against the Cuts, All rights reserved.